She called me "the lady in pink" that first day of class in June, when I raised my hand to answer her question I couldn't even remember, something about Economics maybe, as that's what the class is about. And from then on, I have fallen in love with her teaching prowess. I'm not good in Economics. But I did read every single page in our Econ book that she would ask us to read, and did every assignment she would ask us to take home. I listened to her every discussion as she wouldn't allow books on top of our table while she's discussing. I enjoyed her class that I got really good grades in all my quizzes, unit tests and quarterly exams. I'm not being arrogant but I'm just proud to say that I think I got the highest grade in class- in Econ, that is. She even asked me to be the class recorder of grades and seat works and I was happy she trusted me with that. Her witty antics spiked up every classroom activity we had. I loved her class the most, apart from my English-Lit and Filipino. Even if she'd ask us row by row to line up in front, and we would start looking at each other as if saying 'what's this about?' Never did we know it's time for her so-called firing squad recitation, her signature kind of recitation, aside from the "shotgun" one. The mechanic is pretty simple, first student in line should answer the question, if he or she can't, sorry but minus points for everyone in the line! I don't really know, maybe she had a fascination with guns or something. We have firing squad recitation, shotgun (where she will just point at you and you should stand straight and answer) but this one is definitely the best- before we officially start the class, she'll check for bits & pieces of trash, then she will point at them and say "Kalats over there, taks! taks! taks!" *pointing her fingers like a pistol*and the class would burst into laughter. Her ultimate crush? Who else but MMDA's BF? She was so happy that morning when she was able to watch BF in Umagang Kay Ganda. She was giggling when she said "Ang chubby chubby niya! That's my Mr. Chubby!" I missed her smile and her giggles after I graduated from high school that WInnie and I visited her in the summer of 2006. We learned she was just recuperating from breast cancer. She was full of hope then, still all smiles after all those time. We sat down in her sala and she started her stories. She didn't teach for a year, trying to gain strength for she'll be going back to school the year after that. She taught for another two years, if I'm not mistaken. I never went back and visited her. Although I did have plans last 2007 and 2008, they never pushed through. Never did I know that my visit during that summer, was the second to the last. Her cancer metastasized. January of 2007, she accidentally tripped, and eventually they learned that she had bone cancer. I saw her for the last time yesterday, my favorite teacher lying peacefully. I talked to her mother, and then to her sisters. "Oh, you're the lady in pink she's always talking about!" blurted one of her sisters. Wow, I never thought she would include me in her conversations with her family. Her mom who went home from the US was holding my hand as I was telling her stories to comfort her. And then I looked at my favorite teacher for the last time. Holding back my tears, I whispered my prayers. I felt a pang of guilt. I should have visited for another time and showed her love. Knowing what she went through, which was highly unimaginable because a person like her doesn't deserve that kind of a treatment, I felt sad, disappointed. But then, on the other hand, knowing that she is now in the hands of our Father made me feel better. My favorite teacher died in pain, physically and emotionally. She's finally happy, and pain-free. After each class, she would always say (and sometimes wave to the class) "Goodbye, for now!" Now, I'd be the one to say that to her. "Goodbye, for now!, Ma'am Finina Contreras!" 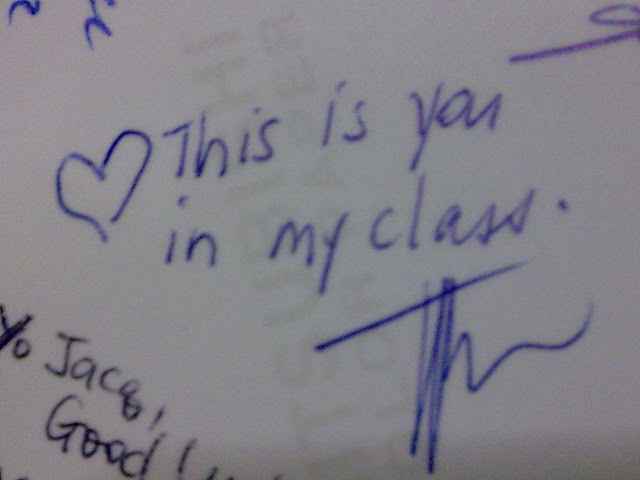 Remember what you wrote at the back of my class picture when I asked you to sign it? 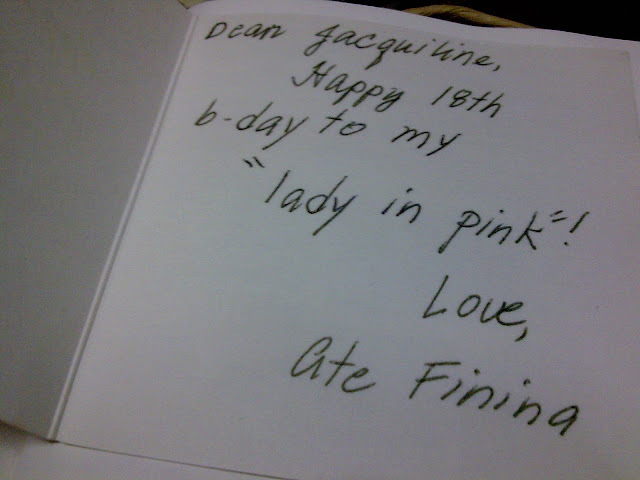 Now it's my turn to say, "You're always here ♥ "
I love you and you'll always be my favorite teacher. You know, I've forgotten she used to say that, pitch somewhat higher than usual, as she rounds up her things and, in our case, prepares us for our first class in Chinese. Man, this is getting more surreal by the minute. Hahaha. Sir de Vera? Here I go with my infamous I'm-getting-forgetful-through-my-old -age one-liner.